you find that for every 20th run it will sleep for 1ms. That in itself is not a big deal if your method takes longer to execute. 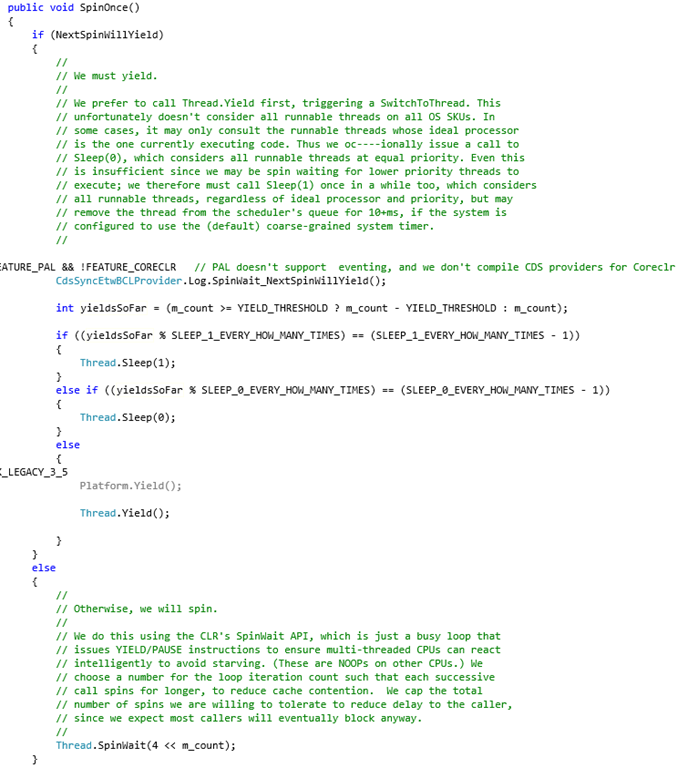 Only by looking at the code all looks sound and reasonable. What could possibly go wrong? 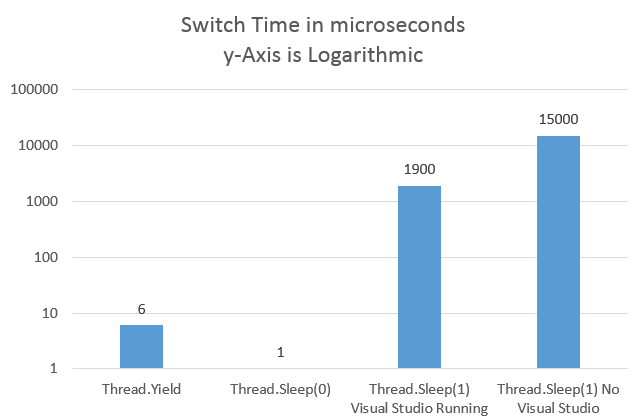 Let have a look at the costs for a context switch with Thread.Yield, Thread.Sleep ( 0 ) and Thread.Sleep( 1 ). Thread.Yield is quite cheap if the other thread has not much work to do. The cost looks like 6 microseconds for doing only a context switch and up to 70 microseconds if the other thread is doing some work until it waits again for something. 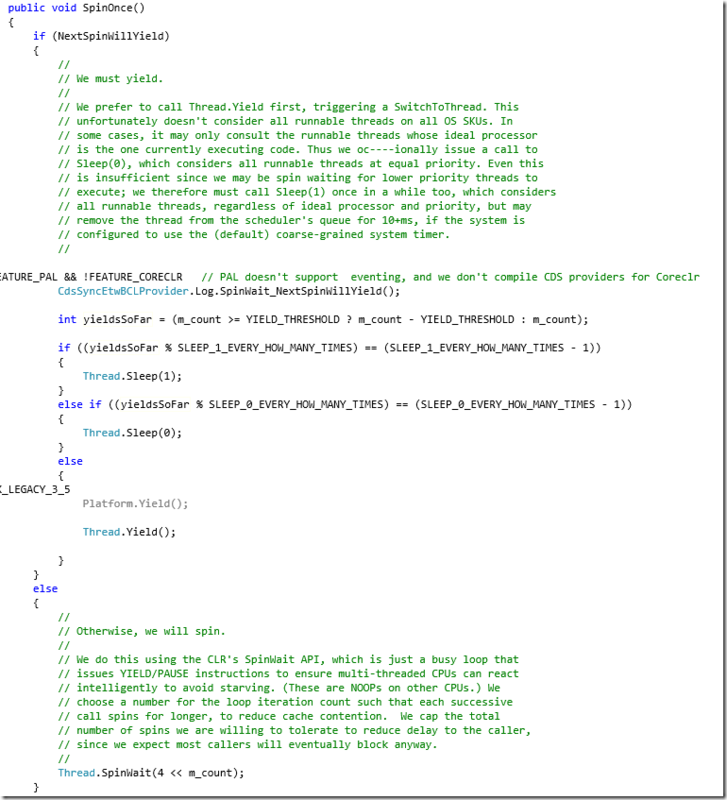 Thread.Sleep( 0 ) on the other hand lets the thread run forever if no other threads want to run on this CPU. The scheduler looks after the thread for ca. every 250ms where a non switching context switch event is logged but apart from that nothing is stopping my thread. Things become interesting for Thread.Sleep(1) where we forcefully give up our thread quantum. Remember the goal of SpinWait is to spare you an expensive context switch. It spins for about 20-80 microseconds. Then it tries from time to time a Thread.Yield, Thread.Sleep ( 0 ) and every 20th time a Thread.Sleep(1). In the comments of SpinWait it is noted that a thread can wait for a long time. In fact a Thread.Sleep(1) can sleep up to 15ms because you give up your current thread quantum and the scheduler looks after your thread only during the next clock tick which is 15,6ms later again to check if your thread is ready to run again. SpinWait is therefore only useful if your operation completes within a few microseconds in 99.9% of all cases. But if your operation frequently or nearly always takes much longer than a typical context switch then this class will not make you any faster. Instead of sparing a few microseconds you are potentially wasting up to 15 milliseconds every time you call SpingWait.SpinUntil! If you have many call stacks in your application which cause SpinWait to sleep for a thread quantum of 15ms then you are using SpinWait wrongly! This one was very hard to find because I usually search for long pauses when I am after a one second delay. But this time 600ms were scattered across dozens of calls almost evenly distributed throughout the use case because SpinWait was used in a central low level component which was frequently called. 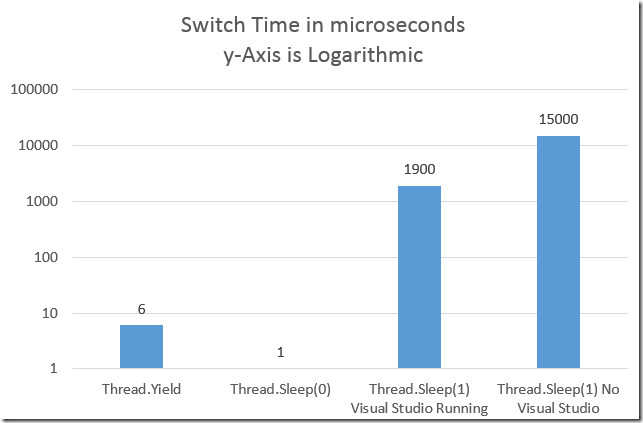 If you looked at the Excel chart above and wondered where difference between with and without Visual Studio for Thread.Sleep(1) comes from I can tell you now. By default the windows timer ticks every 15,6ms which then triggers the thread scheduler to check out its running threads. The strange 15,6ms value comes from 64 ticks/s = 15,6 ms/tick. If someone uses a multimedia resolution timer or changes the system wide timer tick to increase the tick rate your threads will more often be watched after the thread scheduler. That is the reason why Thread.Sleep(1) can wait for "only" 2ms or 15 ms depending on which applications are running which may alter the system wide clock rate. Another great source of many more details can be found at https://randomascii.wordpress.com/2013/07/08/windows-timer-resolution-megawatts-wasted/. You can use the clockres tool from SysInternals to check out your current timer resolution. The dynamic windows timer tick rate makes it especially tricky to find performance degradations with unit tests on machines where Visual Studio or another WPF GUI is running where the tick rate is 1kHz. But on an installed server the clock tick rate is 64 which will make a big difference. Luckily the performance regression tests did show the issue long before any customer would get this version. It really pays off to performance regression tests. It is even better if you not only execute performance regression tests but you use xperf to record profiling data for all performance tests and store profiling data somewhere. Later when a test breaks you don't need to go to the testing guys and ask them to install the current baseline which has the issue and an old baseline which was good. Then you need to profile both use cases and then you can start analyzing. What a waste of time! It is much easier to let your central performance tests run with ETW profiling which will affect even heavy use cases < 10%. But you get all the data you could wish for to find the root cause much faster. If you train the people how to use WPA to analyze issues and how to use PerfView, Windbg, VMMap and memory dumps you can create software which has significantly less issues than your competitors because you really understand your system. The usual thinking to treat system libraries and the operating system as black boxes where miracles happen has its place to not be distracted by the many things you need to consider before you write one line of software. But you should not stop at the black boxes. Instead you should develop the ability to look into the black boxes when necessary and write a nice blog post about the found issues so other people can learn how things (not) work. Also note, that Stopwatch timestamp values are not ticks, they are in a runtime-varying frequency. Stopwatch "raw" ticks and TimeSpan ticks are not in the same unit, the TimeSpan (or DateTime) tick is always 100 nanoseconds. It's not fixed. Use Stopwatch.Frequency to find out about the frequency. That timing experiment proposed by cao is highly unreliable. ok the dot was missing. Now it is TimeSpan ticks. It´s interesting to see that I get much more comments if I add some easy error. The profiled data it not affected by it since the actual timespan is not relevant. It only needs to be longer than ca. 80 microseconds. Ok, I must admit that the ticks comment was not really constructive :). Your analysis is interesting and a good example of ETW usage. It is funny that you posted it because I had to create an AggressiveSpinWait class to avoid the Sleep(1) a few weeks ago. An alternative solution would be to increase the timer tick rate with timeBeginPeriod so you sleep at most 0,5ms if you wish which is the maximum precison you can get. After the sleep you could revert to normal without wasting much CPU cycles.